The following is an abridged version of remarks delivered at the Arlington County Board’s January 2nd Organizational Meeting. The full text, with specific proposals and further details on each of these themes, is available online. In 2018, what does it mean to translate Arlington’s history, our community’s values, and even our foundational texts – planning documents, rather than literary – for our modern times? For example, “to tell the old story” of Arlington is to tell of the fight for inclusion: Defiance of Massive Resistance and integrating our schools; waves of immigrants and refugees shaping the County’s culture and economy. In our current national political moment, Arlingtonians have risen to affirm that history, and those values. Inclusion is why housing affordability – an issue given structure and a policy agenda in the 2015 Affordable Housing Master Plan – continues to be such a bedrock issue for us all. What this community looks like, and who calls it home, is in part a function of the cost of its housing. My goal — building on and with the ideas advanced by our new colleague, Erik Gutshall, and other community leaders — is to more substantively and specifically engage this “Missing Middle” conversation in 2018, producing a few examples of what it means in Arlington. The Lee Highway Planning effort and the development of Housing Conservation District tools ahead both represent opportunities to explore these forms, and to translate our values of inclusion into housing policy. Childcare accessibility similarly speaks to the foundational values of Arlington County. On January 25, we will launch an Action Plan, drafted by a multi-agency partnership, with parents, providers and neighbors. 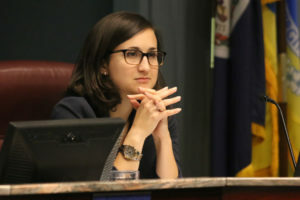 As the action plan proceeds, I anticipate that long-awaited steps will be before the Board soon, such as a potential re-examination of our local codes for alignment with the Commonwealth’s; potential zoning changes to decrease barriers to entry of childcare centers; and new partnerships to increase the supply of trained childcare workers. 2018 is a critical year for restoring and supporting Metro, achieving a sustainable source of funding for Metro, and engaging constructively with the many reform proposals for its governance and operations. The regionalism of the 1950s and 1960s is our map here: Arlington will be most effective in partnership with our fellow Northern Virginia jurisdictions. Christian Dorsey’s leadership on the Metro board will be essential to representing Arlington’s interests in any reforms adopted this year, and to establishing a more effective system. In collaboration with colleagues from Northern Virginia’s Metro jurisdictions, and from jurisdictions like Prince William, Fredericksburg, and Stafford, I will be leading legislative efforts on behalf of NVTC and the Virginia Railway Express. We must present a common vision from the region to the General Assembly as they deliberate on dedicated transit funding in the biennial budget. Returning Metro to sound footing is a necessary but not sufficient step to turning around our commercial vacancy rate, which will continue be a priority for 2018. We are wrestling with anticipated budget gaps: Significant ones in FY19, growing greater in the out years. The only way we get out of painful choices that pit our priorities – a moderate tax rate, quality schools, transportation, parks – against one another is growth in the commercial sector. This year, we must continue aggressive pursuit of expanded and new commercial tenants. None of these objectives will be without controversy. So to translate the Arlington Way for our modern times, it’s time to return to these big conversations, and talk more directly to one another as neighbors. To do that, we need more citizen leadership of the public dialogue. I look forward to launching, with our Commissions, a series of “Big Idea Roundtables,” that will provide constructive venues for residents to discuss the big questions about the County’s future with each other. I’m also looking forward to the implementation of County Board and County Manager efforts to improve the customer service experience of those interacting with their local government in 2018. Finally, in 2018, we will need to be steady in the face of federal instability: Still-unknown implications of the new tax reform law; continued deportation threats to our young people if and as DACA expires; threatened cuts to the funding streams our safety net depends upon. Through it all, however, Arlington will be made sturdier by our proud history and by our striving to constantly live and evolve our values. Katie Cristol was elected to the County Board in November 2015 and elected by her colleagues as County Board Chairman for 2018. She has been a community advocate and public policy professional during her time living in Arlington.